Whether or not you’re a fan of this classic December practice, you undoubtedly understand its intent. This time of year, we all look at the achievements we’ve ticked off in our lives and the goals yet ahead, prioritizing the future to correspond with the spaces we most yearn to fill. When we’re kids, these lists tend towards the fantastical. (“Meet Big Bird!” “Go to Disneyland!” “Fly a spaceship!”) Once the listmaker is an adult, however, most New Years resolution lists get pretty stale. (“Get on the property ladder!” “Lose 15 pounds!” “Stop scrolling Facebook ten thousand times a day!”) We’re here to suggest that you roll back the clock a bit. Tackle this New Years resolution list like it’s a bucket list. 365 is a lot of time if you use it right, and you have a lot of ground to cover! 1. Check off item number one. You know what it is. C’mon now. And we know what it is, too. A whopping percentage of the first-time tandem skydivers who come to Skydive Monroe come here to check it off. 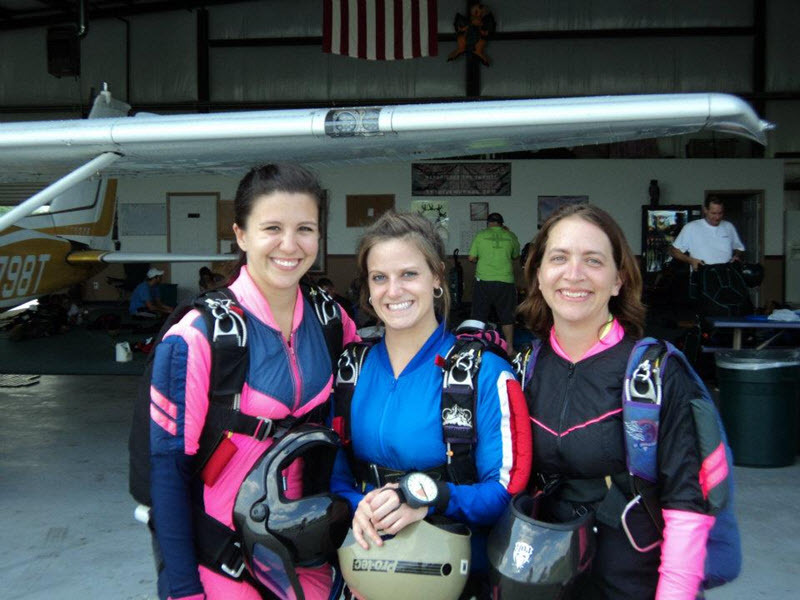 Skydiving is the number-one bucket list item because It deserves that rarefied placement! It’s actually a very powerful kick-off to the rest of the list. You’ll be interested to know that most people report that it’s easier to work their way down the rest of the items once that “do a skydive” item is struck through. We attribute this phenomenon to the boost in confidence a skydive creates–but whatever it is, it works. 2. Make sure you’ll be around to do item #2. No matter where you are on this pale blue dot, the best place to find the safest, most professional, most up-to-date skydiving dropzone is by far the dropzone listing maintained by the United States Parachute Association. As the organization that sets the standards for polict, technology and training, the USPA has actively pushed our sport into safer and safer territory since way back when the sport was founded. USPA member dropzones are special, because they uphold a pledge follow USPA’s exacting requirements as far as safety, instructor training and equipment maintenance. If you’re wondering: Skydive Monroe is a USPA member (and proud of it)! And y’know what? This isn’t just your New Year resolution we’re talking about, either. How about buying a tandem skydiving gift certificate for that special someone (or that whole crowd of special someones!) that could use a crisp smash of the reset button in their lives? Taking your whole tribe into a new era means that you could be the catalyst for some beautiful personal revolutions in the lives of those you care about. Now get out there and start throwin’ high-fives!